Nora Kiss was born in 1908. Her French identity card, dating from 1948, gives her name as Eleonore Eugénie ADAMIANTZ known as Adamoff. Nora Kiss was probably born at Kislovodsk [i], although another document gives her birthplace as the nearby town of Piatigorsk [ii]. Her father, surnamed Choucha, was, like her mother, of Armenian origin. 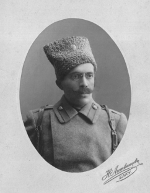 He was an officer in the Tsarist army, and after the Revolution remained trapped in the USSR by the onrushing events. In 1917, he returned to Baku, and Nora was never to see him again. On her marriage, however, he sent her a Caucasian carpet (machine and not hand-made, as he no longer had the means to send her a "real" one). Worn thin, that carpet hangs on my wall today. She loved him, and admired him. Her relationship with her mother, the actress Tamara née Sarkissian, was rather cooler. 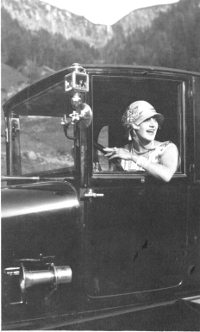 Tamara, sister to the formidable dance teacher Madame Rousanne-Sarkissian, was remarkably beautiful, independent-minded, and indeed, perhaps one of the first women to own, and herself drive, a motor-car. At Moscow, Tamara met the Frenchman Théodore d’Erlanger, married him, and left with him first for London, then for Paris, where they took up residence at 132 avenue de Villiers. There, the couple became host to the great dancer Alexander Volinine, who taught Tamara’s sister, her daughter Nora, and so many outstanding Russian and French artists. On one or two, very rare occasions, Nora spoke to me of her activities in the Resistance during the War. At smart parties in the 20s and 30s, in the d’Erlanger residence, she had met individuals whose sons and daughters later became acquainted with her through the dance. Some of these youths and girls were to join the Resistence, and through them, Nora came into contact with the US intelligence services. It was most likely at their request that she left France for Rome in about 1940, and spent the War there. She gave classes in a private Roman studio, and on the terrace of her flat as well ! Yves Casati is quite right to say that Nora was very knowledgeable of anatomy. She had, moreover, quickly grasped that the dancer needs metaphor, if he is to assimilate that knowledge. She would say things like "you must make sure that there’s light shining between the bones, between the vertebrae". She understood that although the body must be correctly placed from a physiological standpoint, everything that need not be tightly held must absolutely be "let loose", relaxed, while the few things that must needs be held, should be lightly "pinched" as it were - and not scrunched ! – together, and then, finally, one uses an image, whereby the body moves into action. For example, for grand battement she would say, "stretch the leg, and it will rise because you’re chasing a butterfly that will fly right off the tip of your foot”. So it was first be properly placed, and then let the mind do its work ! She insisted that dancing is a vocation, that one should keep on the boards as long as possible, and therefore "protect the body, while pushing oneself to the limit", in other words, never should ignorance and haste be allowed to wreck the precious instrument. Again, Nora considered that the dancer must be at the choreographer’s disposal, free and ready, which to her, meant that classical dance is the fundamental vocabulary, that can and should be used everywhere, and not a recondite habit serving its own ends alone. She would often take us to the Cinémathèque to look at old films, so that we could see for ourselves how both style and technique change, even over short periods of time. When she taught a step, it was never pigeon-holed into a style such that we’d be unable to do it otherwise. She’d explain that there was this way, and that way of doing it, and that whichever style we would adopt, it had to be done thoroughly and right. So we would not be acquiring stylistic effects, quirks from one or another School, but learning the different ways in which a step may be properly performed. vers 1925 au Mont Doré. We would leave her class in a state of great excitement, because she was constantly inventing things. One day the class would be austere and technical, the next she would tell a story and as she told it, we would dance it, live it. But always the professional to her fingertips – no floppy feet! Neither in herself nor in her students would she allow everyday concerns to invade the studio. As it happens, I was at Medical School while studying with Nora, and even after I’d spent a sleepless night, Nora refused to lower her standards ! "Leave your worries and exhaustion in the cloakroom ! No excuses! The public won’t give a fig for your being tired. You’ve come here to work, so go for it !" I first met Nora as a student of Margareta Haïm. Nora saw me there, and suggested that I come to work in her studio as well. By that time, the Studio Wacker had closed, and she was teaching rue Chaptal in Daniel Franck’s studio. The first and greatest influence on Nora was no doubt Alexander Volinine. It was from him, I imagine, that she learnt the science of teaching men. She had also worked with Carlotta Brianza, and told me that at Rome, she first saw what batterie should be, that one has got to really open, so as to see the play of light between the legs, rather than just scritch-scratching the legs together. She would also speak of Harald Lander, and often gave Bournonville steps. Bournonville, she said, knew how the back must be held when one jumps, and that is how we had to learn to jump. She had Toni Lander come in to give us lessons. Nora knew Georges Balanchine well, and travelled to New York to see him several times. In her view, he had invented nothing, in terms of steps, but had a genius for giving shape to the classroom steps he had learnt at Saint Petersbourg. To her mind, his real achievement lay in how he had used to best advantage the shortcomings in American dancers of that time, who may have lacked a classical tradition, but who were nonetheless possessed of speed, energy, a sense of rhythm and of the group. That, she said, is what made his style. On several occasions, Nora took us up to the Ballet du Nord, which was led at the time by Alfonso Cata, a pupil of hers who had been with Balanchine. We would either watch, or take the barre and do centre practice with him. When it came to pedagogy, Nora would say "Do not attempt to cook up a theory. Try it out on yourself first, and if it works, you may try teaching it to others !" She was extremely suspicious of pseudo-scientific or academic theories, that might wreak harm on the dancer’s body. Her husband’s name was in fact Ladislas KISH and not Kiss, a Hungarian painter and film director. For some time Nora too had Hungarian nationality, although she became a French citizen in 1950. [i] Thermal resorts in the North Caucasus (there are five such towns: Mineralnyé Vody, Jeleznovodsk, Piatigorsk, Essentouki and Kislovodsk, all in the Stavropol area). [ii] Piatigorsk, where Lermontov, author of A hero of Our Time, was killed in a duel in 1841.